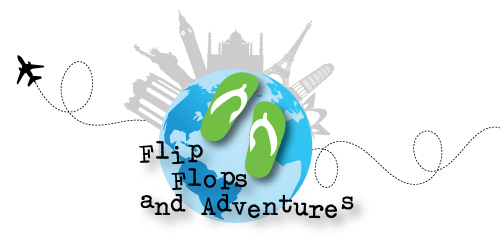 Do you need some creepy inspiration for your next trip? 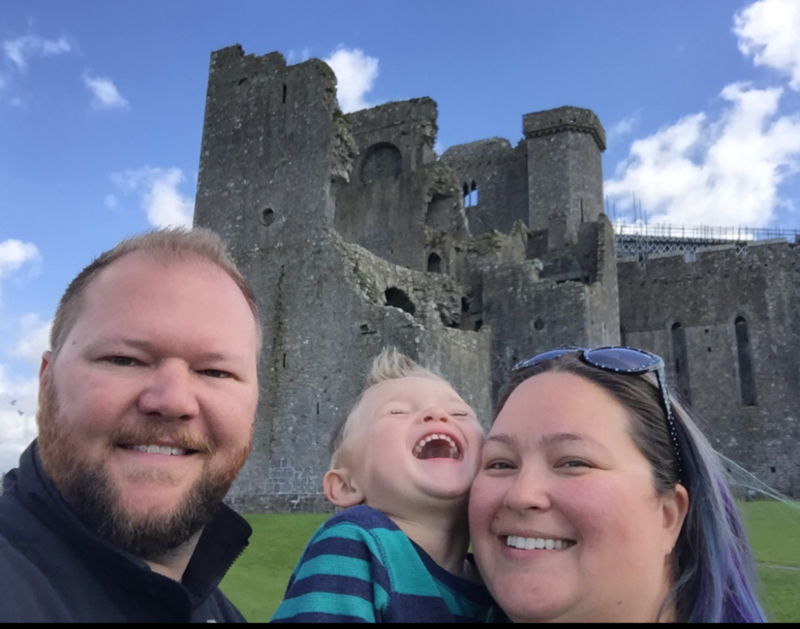 Check out my list of favorite creepy places that we have experienced so far. I always love to find the creepy options when I visit a new place. 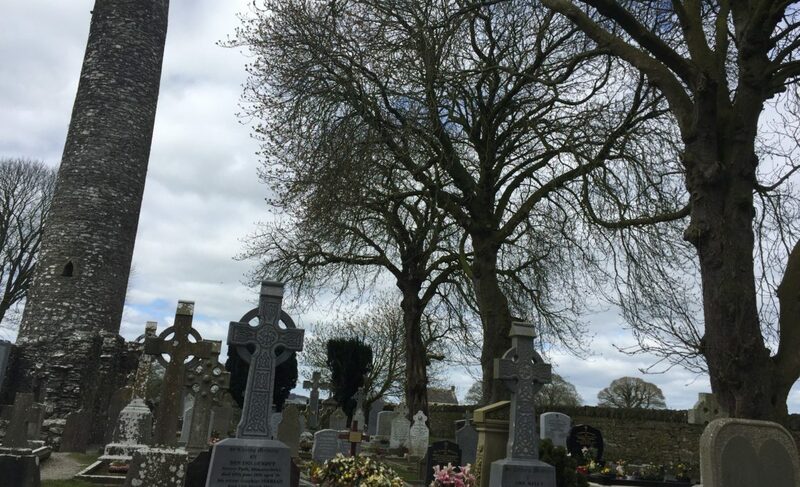 I dont know why, but cemeteries and places with weird or spooky legends are just fascinating to me! I can not leave a cathedral without checking the basement and the corners for a relic or a tomb. I simply HAVE to stop and take a walk when I spy a little gated cemetery-the older the better. This was the most beautiful and peaceful cemetery that I have ever visited. 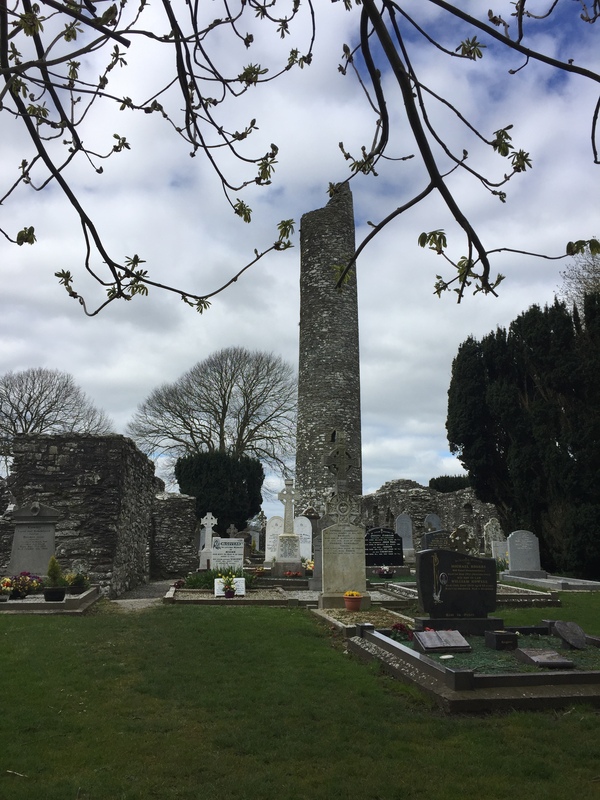 It had a fascinating history with the round tower that was used in defense of Viking invasions. 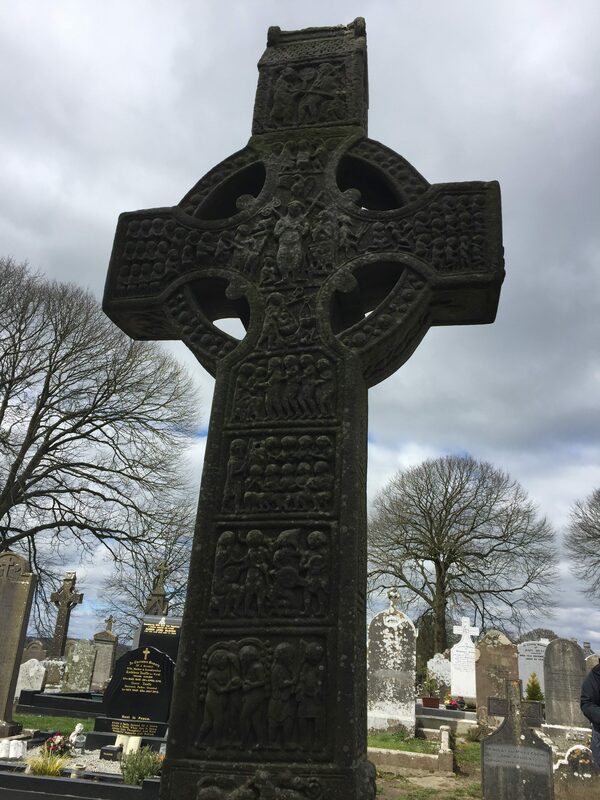 Founded in the 5th century, this is the place to see some of the most intricate and beautiful high crosses in Ireland. 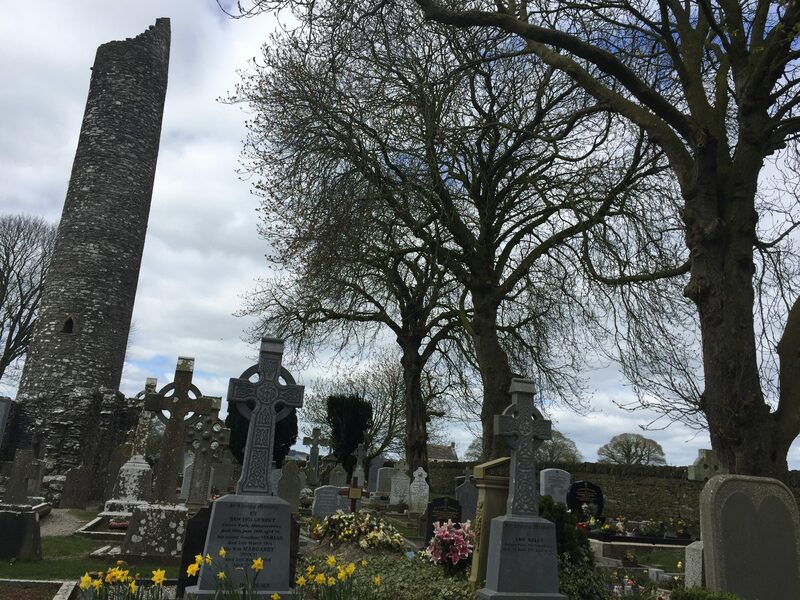 We only had about an hour here, but it was a sunny Irish day and the birds were singing… I was sad to leave! Some people will think I am creepy for loving to waste an afternoon wandering in a cemetery but its one of my favorite, peaceful things to do while I am traveling. 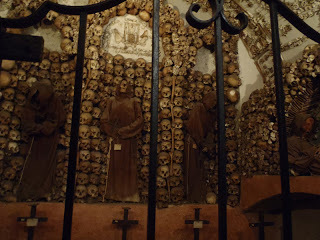 Crypt of the Capuchin Monks- it was way bigger and more elaborate than I had thought it would be. 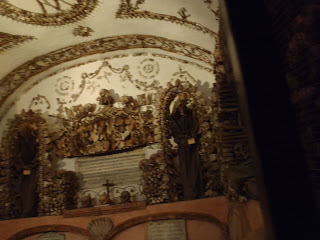 There were 6 rooms and every one was decorated with bones on all the surfaces~walls, ceilings, and doors. 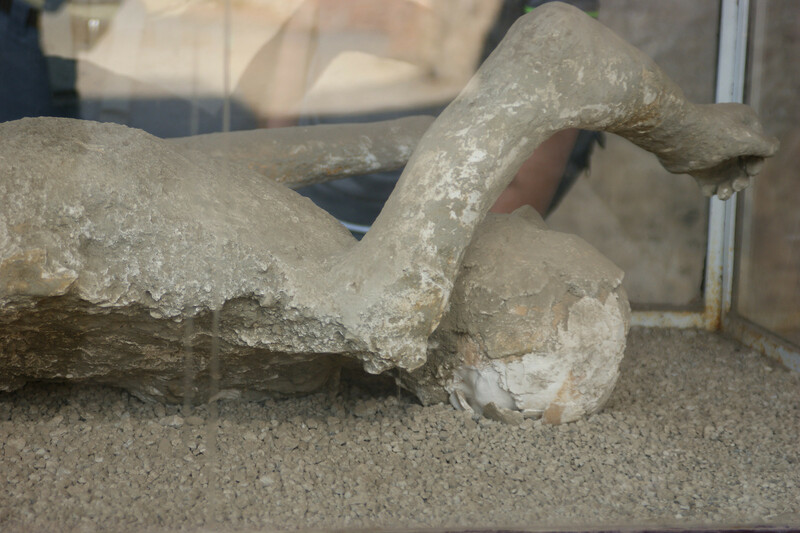 The bones were all sorted by type and they had been made into shapes like a clock or an hourglass. Some of the skeletons were intact, still in their robes with facial hair and skin attached! It was incredible, and fascinating! It made me think of so many questions, like why they did this, what gave them the idea, and what it must have been like when they sorted all of those bones…? 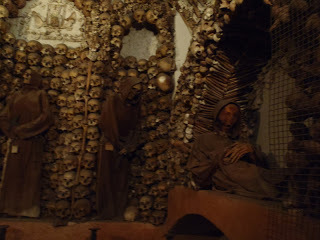 I read a little about it in and found out that the reason they had created this display was because Capuchin Monks are required to only be buried in a Capuchin Monastery, and the order had moved to a new location, so they had to take the previous brethren’s bones with them. They built the 6 room crypt in the new place, but quickly ran out of room. So when they displayed them to make room to bury more, they put them in “cautionary poses” like the hourglass, and still wearing the robes to remind us that life is fleeting and you should always be prepared to leave this life for the next. Still a little bizarre, but I was glad to know what their reasoning was anyways! 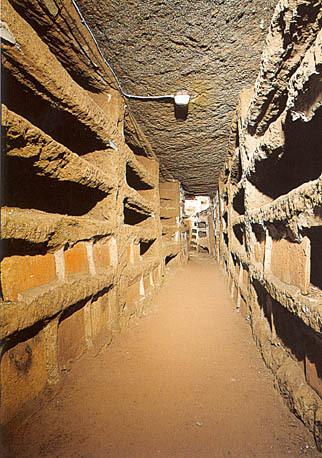 With the growth of the Jewish and Christian population (most of whom were not Roman citizens, with the privileges that would allow) many did not have the means to purchase land to bury their loved ones.Roman law prohibited burial within city limits, so the catacombs were created outside city walls. Walking through them underground and realizing how sacred they were to the people who created them when they buried their martyrs and loved ones there was fascinating. They occasionally held worship services or memorials in the network of tunnels. 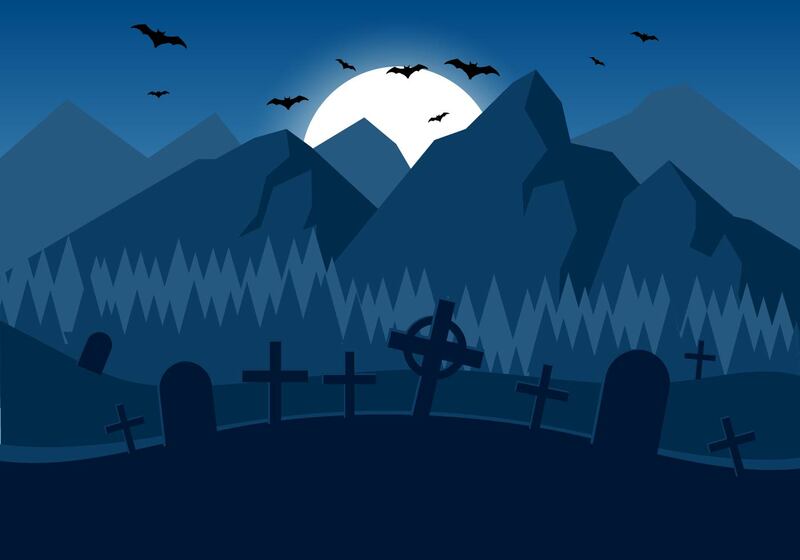 I loved walking and looking and listening to the tour guide, but this was one time that I was very careful to stick with the group, because when you were beyond the flashlight’s reach-it was darker than dark and it would be you alone with the bones! New Orleans is an amazing place to visit in October! 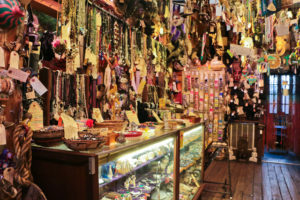 You can pop in to the House of Voodoo shop and buy spells, or look at a voodoo doll, get a tarot card reading. Voodoo is a religion that came from the blending of the traditions brought over with West African slaves, the French, Spanish and Creole and Catholicism, along with many other influences.Marie Laveau was the renowned Voodoo Queen in New Orleans in the 1800s. She was well known, and there are many tales that have been repeated although very little is substantiated about her life. The legends have inspired many songs, books and movies. 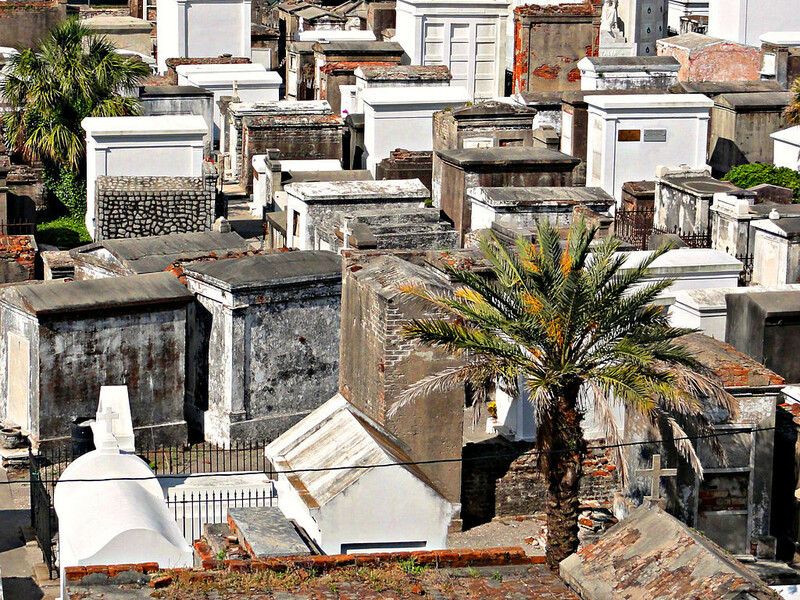 You can walk over and take a tour of one of the well known Cities of the Dead in NOLA, most people’s favorite is St Louis Cemetery 1. 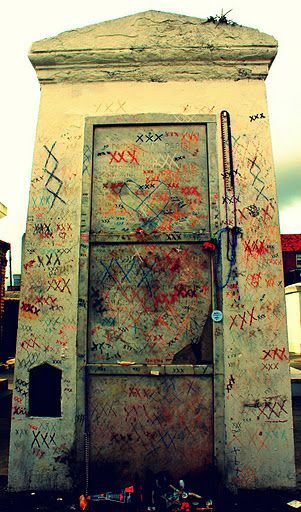 People still love to visit the tomb of Marie Laveau there and leave her offerings and notes and wishes. I can spend hours wandering there and looking at the sculptures, the inscriptions and the buildings. 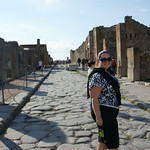 Walking through the streets of Pompeii and seeing all the details of every day life and knowing that in only minutes the entire city was buried was certainly eerie. 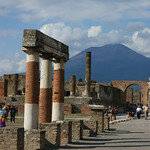 You can stand on many of the streets you can see Mount Vesuvius, still with an uneven top from the eruption that day many years ago! It sent a chill down my spine to think that I was standing in the shadow of that powerful volcano. 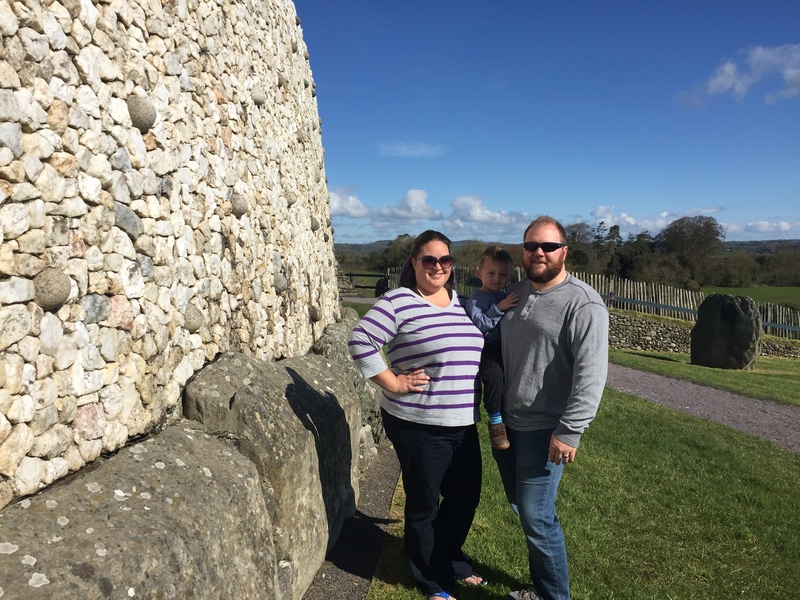 Newgrange was built over 5,200 passage tomb and ancient temple was probably the oldest and most mysterious place that I have ever visited. Most of the places that I have found interesting, we can find the answers to most of our questions. 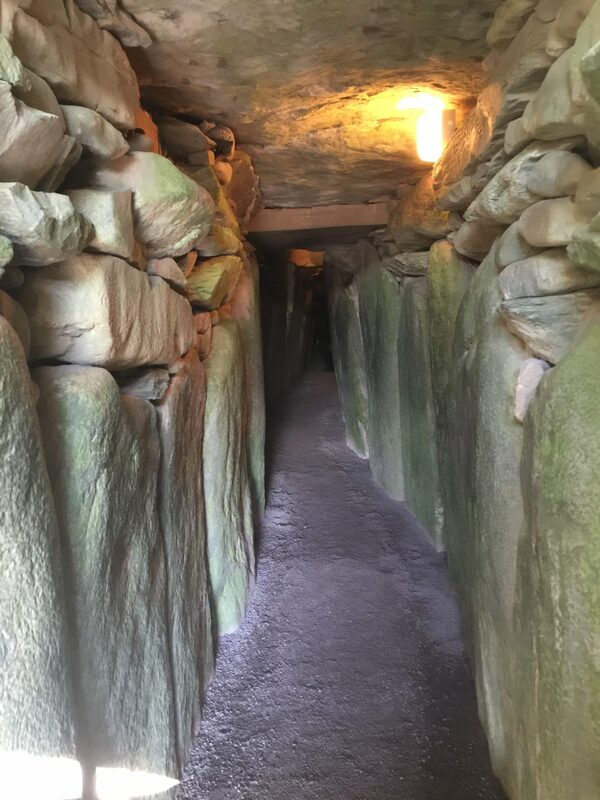 But Newgrange is so old that there are hardly any answers to be had. Historians know that is was sacred, used for rituals. 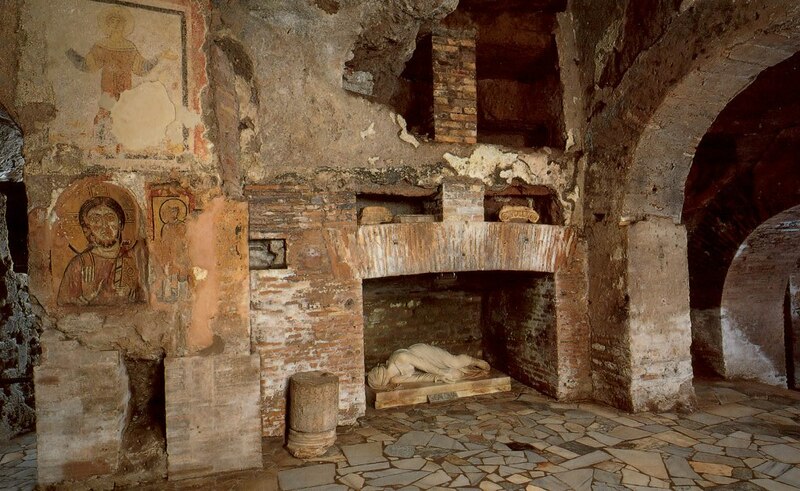 Both burnt and unburnt human bones were found throughout the interior chamber. They dont know what kind of rituals and what the significance of the alignment at Winter Solstice sunrise means. We went on a tour of Newgrange and they turned off all of the lights for a minute. It was truly dark and showed how carefully and accurately it was constructed so that the Winter Solstice would illuminate the chamber. I left the tour with so many more questions than answers! 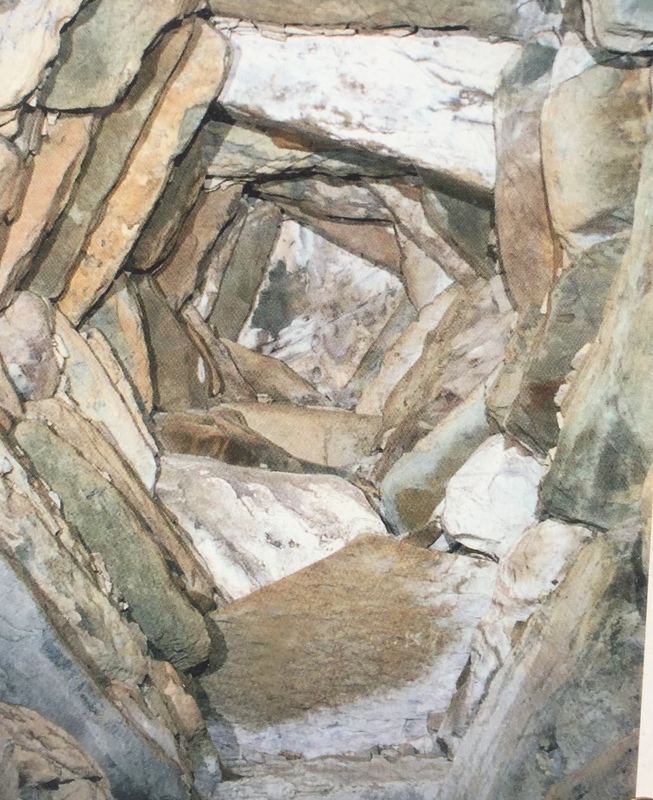 This is an amazing roof that has supported tons of earth and rocks for thousands of years. Have you been somewhere creepy while traveling? 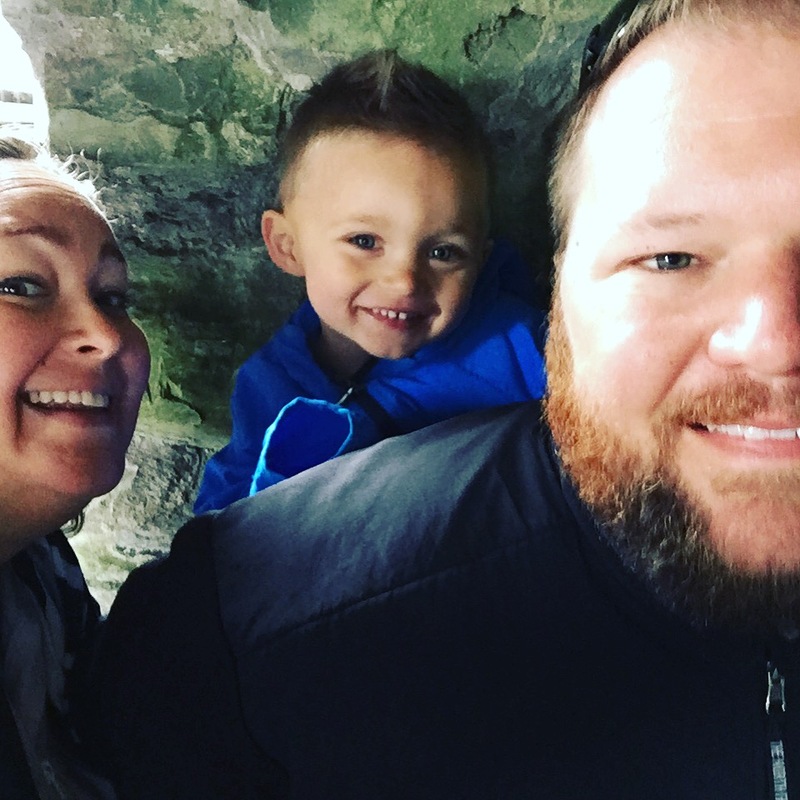 I would love to hear about your favorite creepy sites!! Wow, Super creepy. 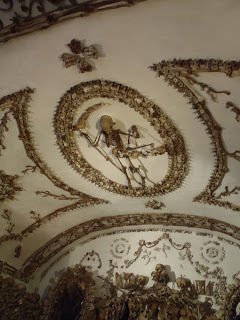 All those skulls… yikes, very cool though. looks like a fun adventure. LOL, I dont know why but those creepy things are my very fave to seek out when traveling.